Ox people are hard-working and persistent, they can stick at a task longer and go at it harder than anybody. They believe in themselves and tend to classify almost everything into two basic categories, good or bad. They hold up their high standards as a model and severely judge those who don’t aspire to maintain these same ideals. Ox people are not social or party animals, they tend to be quiet when in a party. Although appears to be tranquil, in fact, Oxens are ponderous but impulsive when angry. They are capable of fearsome rages, therefore, it is better not to cross an Oxen. People of this sign are usually very patient and inspire confidence in others. However, they tend to be eccentric and are easy to anger. They have fierce tempers and even if they speak little, when they do they are quite articulated. They also are mentally and physically alert and are generally easy going. They can be remarkably stubborn and hate to fail or be opposed. Among the "twelve animals" the colorful character of the rooster will bring sunshine into an ox’s life, and become his best friend. Both of them have the spirit of devotion and so they can get along with each other well. The sentimental mouse and the clever snake also can get along well with the ox. People born in these two years will take care of an ox. 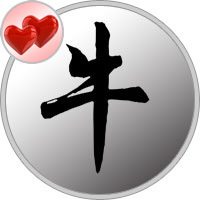 People born in the year of the rabbit, dragon, and horse, as well as others born in the year of the ox will also have a good relationship with them, but these relationships may not be close ones. People born in the year of the dog may consider the ox very dull because the ox generally lacks a sense of humor. People born in the year of the goat and the tiger will complain that the ox has too much authority over them. Ox and RAT: Very compatible. Excellent marriage and business relations. Mutual understanding and happiness. Will be prosperous together. 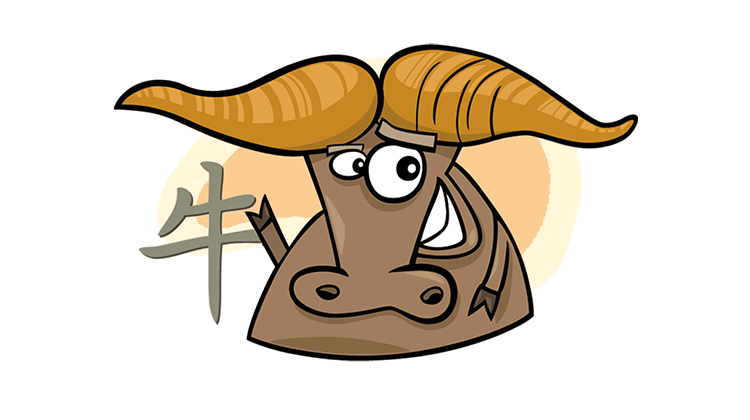 Ox and OX: May have areas of common interests, but no deep understanding of each other. Will cooperate only when necessary. Ox and TIGER: Personality clashes and bitter rivalry. No understanding of each other. Animosities and mutual distrust. Unable to resolve their differences. Ox and RABBIT: No major conflicts. Congenial and solid relationship. Compatible to a good extent. Could work as a team. Ox and DRAGON: Mutual respect for one another. Workable relationships. No large differences or struggle for dominance. Can cooperate for the common good. Ox and SNAKE: Very good match. Will be sympathetic to each other’s fellings. Relate extremely well. Will form profitable and lasting ties. Ox and HORSE: Nothing lasting or permanent will result from this union. Moderately congenial relations are to be expected at best. Communication barriers. Ox and GOAT: Will just tolerate at best. Certain degree of indifference and conflict in their union. Will maintain a cool relationship at best. Uncooperative and incompatible. Ox and MONKEY: Have mutual reservations about each other. No outright confrontations, but will not find any common ground for negotiations. Ox and ROOSTER: Excellent union. Very successful team. Will have no difficulty in communicating with each other. Will find love and happiness together. Ox and DOG: Some animosity and unsympathetic feelings. Have nothing much in common. Will not relate well to each other. Ox and PIG: No personality clashes. Compatible to a certain extent. Acceptable but cool relationship. No struggles or lasting bonds either.